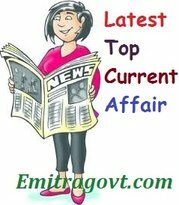 Current Affairs Question 2017: Looking for 6st August Current Affairs? Then start your Quiz right now by answering them. Here in this article, we are giving the Current Affairs Quiz with Questions and Answers. As many people are preparing for various government exams it became mandatory for them to get a grip over the current affairs as in most of the tests are based on Daily Current Affairs. By taking this kind of Current Affairs Quiz candidates can eventually get hold of what they have been working on. Contenders can trust us as we will update all the latest Current Affairs in this quiz. For more such quizzes check our site Emitragovt.com regularly as we will update the Daily Quiz for current affairs. 1. Senior bureaucrat Mohammad Mustafa has been appointed as Chairman and Managing Director in Small Industries Development Bank of India (SIDBI). 2. India’s second largest software services firm Infosys will acquire Brilliant Basics, a London-based product design and customer experience (CX) company. 3. The Maharashtra government launched a motorbike ambulance service to provide swift medical assistance to patients. 4. Kalyani group and Israel’s state- run Rafael Advanced Defence Systems commissioned a Rs 70 crore anti-tank guided missile production facility. 5. Maharashtra Government has launched ‘MahaDBT portal’ to streamline the process of direct benefit transfer (DBT) and ‘MahaVASTU portal’ to bring in more transparency in construction sector. 6. The American Senate has unanimously confirmed three Indian-Americans to key government positions. The Senate confirmed Neil Chaterjee as a member of the Federal Energy Regulatory Commission and Vishal Amin as Intellectual Property (IP) Enforcement Coordinator in the Trump administration. Krishna Urs was confirmed as the US ambassador to Peru. 7. InCred, the Mumbai-based financial services group, has signed up former cricketer Rahul Dravid, as its Brand Ambassador. 8. Israel Launched its first environmental research satellite ‘Venus’. 9. India’s Manju Kumari clinched the bronze medal in women’s 59kg category of the Junior World Wrestling Championship in Finland. 10. Spanish motorcycling legend Angel Nieto died. He was 70.